Found this great card challenge blog called Caardvarks and decided to join in the fun challenges that they have. The current one is to use patterned paper from three different manufacturers on the front of your card. 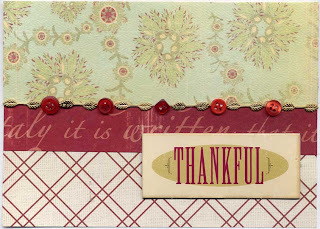 I am also trying to use up my scraps so I went digging in my scrap pile and these are the two cards that I came up with. Paper: Crate Paper, Colorbok and Scenic Route; Metal Accents: Nunn Designs; Chipboard: K&Co; Other: craft store buttons. 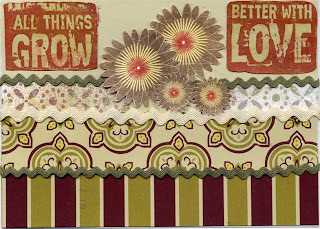 Paper: Paper Salon, Crate Paper and Basic Grey; Ink: ColorBox; Stamp: Club Scrap; Other: craft store ric rac. This is a great way for me to put a dent in my growing pile of scraps.